Last Dystopian February I reviewed INSIDE OUT and I loved it. I gave it 5 zombie chickens and declared my love for Riley. (Read review). 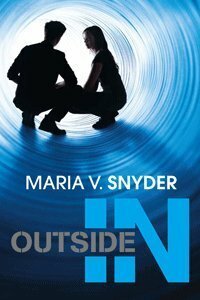 OUTSIDE IN is the sequel, so if you haven't read INSIDE OUT, you'd best skip this review since there are necessarily spoilers for the first book. It took me a few chapters to sync with the characters after so much time away from them. There's a scene early on where Trella and Riley are VERY happy to see each other, and Riley came off as kind of pervy. It probably would not have seemed that way to me had I read the two books together, since it's a pretty natural progression of their relationship from the first book. In any case, things are not happy and rosy despite Trella "freeing" the scrubs and finding more levels to inside to expand to. There is a power vacuum and vital tasks are not being done. There's also an exciting new threat (which I won't spoil) and Trella has to find the reluctant leader within her to vanquish it. Again, it's hard to know who to trust which ratchets up the tension. No lack of action here folks. The conclusion makes it sound like this could very well be the end of Trella's adventures, but you never know. I'd certainly be happy for more. I really enjoyed OUTSIDE IN, but not quite as much as the first book. I give it 4 zombie chickens. OUTSIDE IN comes out on March 1st. Find out more about it at the author's website. It sounds like a great conclusion to the story! What a cool sequel title! I hadn't heard of this series. I'll have to check it out! 4 zombie chickens definitely sounds good.. I read there books back to back, and as you said didn't see anything pervy about Riley. I did however thought he was a little hard on Trella, with good reason - but still! Oh, yay! Thanks for this review--Outside In's been on my Kindle for a while but I just haven't gotten to it yet (you know how it goes with large TBR piles). Think I'll have to read it this weekend since I have to find out what happens now. I have the first book in this series to read...Hopefully I'll get to it during Dystopian February!! I need to read my egalley of Outside In soon, because omg MORE SHEEPY AND RILEY. Also I want to know the problems Trella faces. I haven't read the first book in this series, but you do make it sound very interesting, and like the second book just sort of naturally just extends out of this one, which is always a good thing. I am glad that you enjoyed it, and I laughed at your description of the pervyness. I didn't read all of the spoiler parts since I'm reading inside out right now. So cool that there's a sequel! Thanks for sharing. Great review! I really enjoyed the first one (still have to post my review!) and I just can't wait to read more. March 1st, it's not so far is it? I still have to write my review on this one but can say I didn't like it as well as the first. Outside of the "pervy" parts -- which I also felt was a little abrupt for Riley's character -- I felt like this on lacked the rootability factor of the first. It was definitely darker and the story felt slower.